The NASA Open Innovation projects develop challenges that seek innovative solutions to research and technology problems that impact human health and performance in short and long duration human spaceflight. The challenges are offered through organizations (InnoCentive and Yet2.com) that offer challenges to a national and international community of potential solvers. A third pilot project was established with TopCoder and Harvard Business School to evaluate an open source code competition. These are pilot projects to determine the effectiveness of open innovation in solving NASA research and technology problems. NASA partnered with InnoCentive, Inc. to provide the public with the opportunity to solve difficult problems facing the U.S. space program in human health and performance. 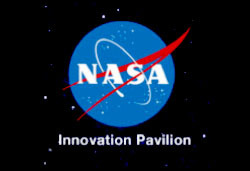 Solutions to the challenges on the NASA Innovation Pavilion will not only benefit space exploration, but may also further the development of commercial products and services in other industries. The first three challenges posted for one of the pilot projects have attracted more than 1,100 potential solvers across 64 countries. These challenges are currently undergoing evaluation for possible winning solutions. As an example, the challenge for a compact exercise device drew over 100 submissions that are undergoing evaluation. The NASA Space Life Sciences developed a strategy in 2007 to pursue external alliances to establish a balanced portfolio of research and technology solutions for human health and performance during human space flight. We sought expertise from academia in mapping research and technology needs or gaps to the best possible collaborative strategy. One strategy that clearly emerged was the use of open innovation service providers to seek solutions to challenges external to NASA. Open innovation was defined by Henry Chesbrough, a professor and executive director at the Center for Open Innovation at UC Berkeley, as “a paradigm that assumes that firms can and should use external ideas as well as internal ideas, and internal and external paths to market, as the firms look to advance their technology.” This open innovation strategy requires NASA to refine problems in the research and technology portfolio into challenge statements that can be addressed by a wide variety of disciplines and technical expertise external to NASA. In this way, NASA seeks to obtain innovative technology, research, service, and software code solutions through the extended community. Each pilot project has a different means of seeking and rewarding winning solutions. We have created the NASA Innovation Pavilion on the InnoCentive open innovation platform, which, to date, has had four challenges (three from Johnson Space Center and one from Langley Research Center). In 2009, we developed an open source competition on the TopCoder community resulting in the writing of 3,500 lines of code and drew more than 1,800 entrants for the posted NASA challenge. These results are currently undergoing evaluation. Later in 2010, we will have completed the pilot projects and will have recommendations for the further use of open innovation challenges to solve research and technology problems for NASA. These recommendations will evaluate the yield of solutions obtained versus the costs of using these open innovation tools (costs may include the actual service cost, time for personnel to be engaged in the process, training time, etc). These recommendations could then include useful metrics for the further use and evaluation of these tools. Potential solutions are provided to the government through open innovation service providers using a variety of business models, but all cost much less than traditional methods of seeking research and technology solutions. A second value to this approach is the rapid development, posting and solution time of weeks for finding potential solutions, instead of months or years required using more traditional means. In order to use open innovation pilot projects, NASA must be transparent in articulating a current challenge for human spaceflight and other challenges facing NASA. These models are inherently participatory as large and diverse communities of solvers around the world may pose a potential solution to a challenge. Depending on the type of pilot project, solvers may collaborate on a solution or establish a partnership with NASA to develop the proposed deliverable. These pilot projects greatly diversify the number of potential external collaborators for NASA. Identify second round of challenges for two of the pilot projects and lessons learned developed from the first round. v1.5 Status Update: The first round of challenges has completed. The second round have been identified and posted on the NASA InnoCentive Pavilion. Execute additional challenges both internal to NASA and externally based on the results of the first pilot projects. v1.5 Status Update: The first round of challenges has completed. The second round have been identified and posted on the NASA InnoCentive Pavillion. Develop a contract mechanism to permit open innovation models to be used by all NASA centers across a wide variety of challenges and disciplines. Develop a “how to” guide for the future use of open innovation models within government. Establish open innovation services as a mechanism for problem solving within NASA. Develop a “system of innovation” that will determine the best application of existing and new tools to solving NASA problems. This system could be captured in contracts, processes, or policy in the future.